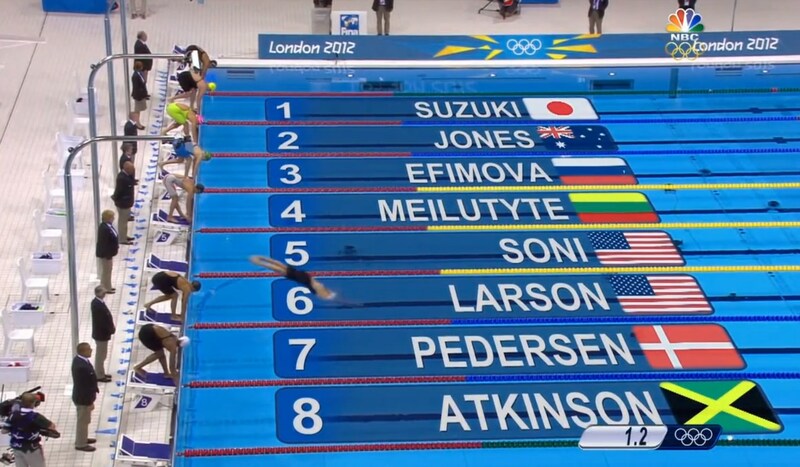 Something has been bothering me ever since seeing Breeja Larson jump into the pool “prematurely” upon hearing the start tone (video). The rules for swimming are very stringent, with no room for error when it comes to false starts… Breeja should have held true to the idea that “the race starts when the start tone is sounded” and not budged. I would have loved to see that actually go down, and witness the moment of chaos once other swimmers realized the race was still on and they all make a mad scramble for the pool in order to win silver and bronze! The Olympic Swimming Committee changed the rules about false starts at the Sydney 2000 games, no longer allowing swimmers even a single false start. I hope the official that messed up got fined hard and fired on the spot… it would be a punishment equal to telling a swimmer who trained for 4 years that all the time, money, and effort they put in were wasted because of a single false start. This entry was posted on Tuesday, August 14th, 2012 at 4:04 pm	and is filed under Life in general. You can follow any responses to this entry through the RSS 2.0 feed. You can leave a response, or trackback from your own site.